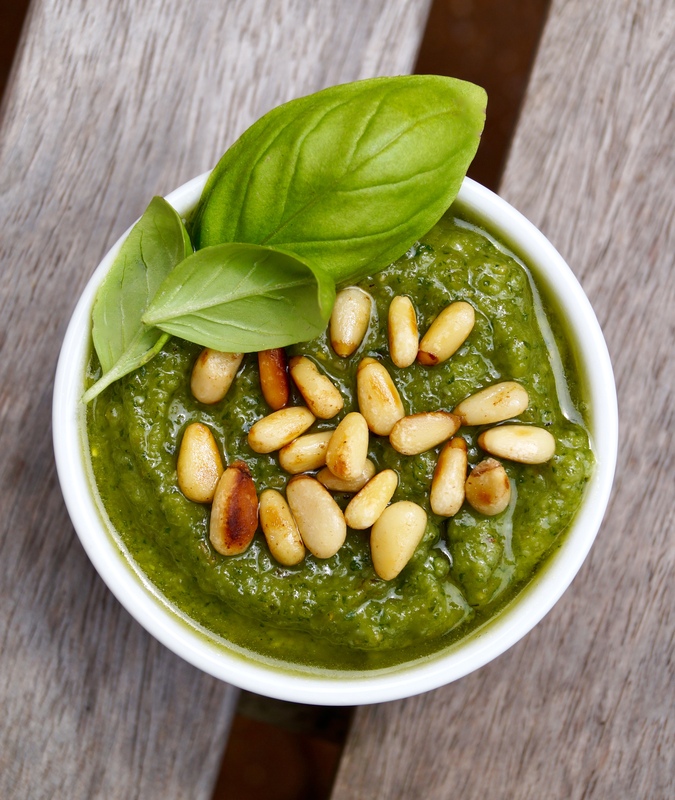 A great basil pesto recipe! Learn how to make to this Italian classic in a few simple steps and with just a handful of ingredients. Today I’m sharing a really simple recipe for fresh basil pesto. It’ll take you literally minutes to make and tastes out of this world good! This homemade pesto is the best pesto I have made to date and it couldn’t be any easier or simpler to make! The “secret” ingredient that makes my pesto taste so good is the roasted garlic. Roasted garlic is such an underrated ingredient, it transforms this pesto and adds a light and sweet flavour. Before I perfected my own pesto recipe, I’d always made pesto with raw garlic. It’s ok, but I find it leaves a bitter taste in your mouth afterwards, whereas the roasted garlic is sweeter and gives a more rounded flavour without leaving a bitter aftertaste. I found these instructions for roasting garlic here. It filled my kitchen with most gorgeous garlic aroma and I would highly recommend you give it a try! With just a handful of ingredients this basil pesto is not only satisfying on the taste buds, but because it’s so easy and quick to prepare it is definitely worth going to the extra effort to make it yourself. Pesto will store in the fridge for up to a week, so it’s ready and waiting for you to use to make a tasty dinner. You can’t beat this pesto mixed through cooked pasta, it’s delicious. 1. In a food processor pulse together the basil, garlic, pine nuts and Parmesan until they are minced. 2. With the processor on slow speed add the oil (a tablespoon at a time) in a slow stream. Now season to taste with salt and black pepper. Process for another minute until all the ingredients are combined. 3. Place the pesto in a jar or bowl and drizzle over a little extra oil to cover the top – this keeps it fresh. Store in the fridge for up to one week. If you can cannot find pine nuts you can easily substitute with walnuts, almonds, cashews or pistachios. For a nut-free version you can substitute with sunflower seeds. Adjust the consistency of your pesto by adding a tablespoon less or more oil. When toasting the pine nuts always toast on a medium heat in a dry pan. Watch them as they burn very easily and will taste bitter. There are endless ways of serving this fresh basil pesto recipe. In the summer and when it’s too hot to cook and I don’t feel like putting together anything too elaborate for lunch or dinner, then pasta salad is a lifesaver! I simply mixed together cooked orzo/risoni with this basil pesto, then I added halved cherry tomatoes and mozzarella pearls (bocconcini). Delicious Caprese pasta salad and this will last for a week in the fridge. You can use any pasta you like, sometimes I use fusilli, penne or even orecchiette. I haven’t bought pesto in so long, as it’s just so easy to make. I don’t make it too often though, as I put it on everything. Thanks Dannii! I agree homemade is always better! Thank you! Pesto is a great recipe and it’s definitely great fun to make too! Pesto is my absolute favorite, yet I’ve never made it myself before! I love this recipe, Jess! Sounds absolutely delicious! Thanks so much Gayle! You should definitely have a go at making your own pesto, it tastes really good! Haha! Glad you like the pesto, David! Roasted garlic really is a magic ingredient especially in homemade pesto! Such a great idea to add roasted garlic! I never thought to add to pesto but it will definitely counteract that bitter taste. Trying this soon! Thanks Elaine – it was super tasty! I made pesto recently with wild garlic – amazing!! Homemade pesto is the best! Great recipe, love it! Pesto is a summer favorite here! That was such a great idea to use roasted garlic!!!! Pinned! Gorgeous pesto! I love homemade pesto and it looks perfect with the pasta and roasted tomatoes! Yum! I love pesto so much that I could eat it with a spoon! But I’ve never made it with roasted garlic…genius! Oh I have to try this pesto. Love the roasted garlic addition. I bet it’s amazing. Yes yes yes yes yes. Pesto is one of those favorites that makes everything taste better. PESTO ON EVERYTHING! Thanks Sarah! It’s so good! Yum – the roasted garlic I bet puts it over the top! Roasted garlic is my jammmmm, and yet I’ve always used raw garlic in pesto. Ive been missing out — using this recipe next time for sure! I love making my own pesto, it’s so much fresher and more flavorful. Looks delicious! I haven’t made pesto, but will have to try it. Yours looks stunning! Thanks Vanessa – that’s great, I really hope you enjoy the pesto! Chef, food blogger and travel lover behind What Jessica Baked Next sharing recipes perfect for every occasion.